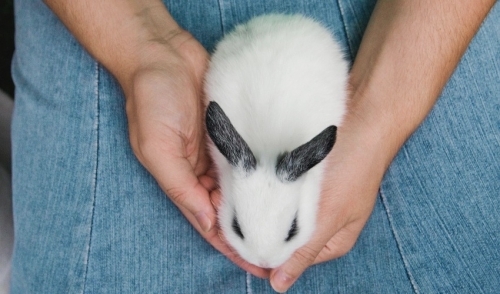 Share "Picking Up Your Rabbit"
When picking up small rabbit, you should generally approach them from the front. Much like other small animals you will want to place one hand lightly on their chest to balance them and one hand on their rump to hold them up. You can also put them close to your body to help them feel more secure. Opposite of small rabbit, larger rabbits should be picked up from behind. However, you should hold them in the same exact manner. What goes up must come back down. Be careful when placing your rabbit back down. He will likely try to squirm and get to the ground as soon as he can. Be aware of this and if he does try to squirm out, make sure it’s as close the where you want him as possible.